Facebook will be rolling out new privacy features later this month that aim to make it easier for you to understand and control how your information is used on Facebook. According to Facebook product Manager, Samuel Lessin, the impetus for the new features is, "...bringing controls in context where you share, helping you understand what appears where as you use Facebook, and providing tools to help you act on content you don't like." Unfortunately, while the new features do make it somewhat easier for you to manage your privacy, they don't actually change any of the rules for what data remains private or what Facebook or can do with your information (either public or private)—an issue that we've expressed serious concerns about in the past. Facebook privacy controls have never been easy to manage; most are hidden in various levels of menus under your user settings. 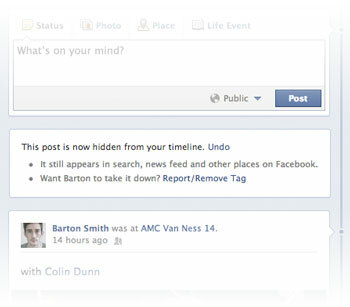 The new Privacy Shortcuts will let you manage key settings through its own dropdown menu on the Facebook toolbar. Choices will include “Who can see my stuff?”, “Who can contact me?” and “How do I stop someone from bothering me?”. We don't have details yet on exactly which settings will be available through each. My advice is to be very cautious about giving apps permission to write to your account. If you don't understand why it would be necessary, don't allow it. Facebook is taking certain actions to help you understand when your content is private or hidden and when it will not be. This isn't a control per se, but more of an improved notification process that content you hide from your timeline may still appear in your news feed, search and other places. Your Facebook activity log lets you see all of your Facebook activity in one place so you can check what you're previously posted, make changes to your privacy settings for past posts and photos, and choose what appears on your timeline in the future. If you're not familiar with the activity log, you can access it by clicking the Activity Log button on your timeline, which appears under your cover photo. Facebook says that the updated Activity Log will have new navigation and new ways to sort information, such as "finding public photos you're tagged in and have hidden from your timeline, but which still appear in other places on Facebook." Within the updated Activity Log, there will also be a new Request and Removal tool that makes it easier to ask people to remove, or at least untag, photos of you. 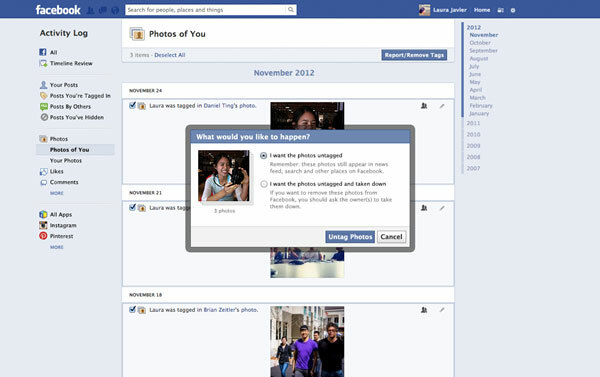 The tool lets you untag multiple photos at once and include an optional message to your friends why you would like your photos removed. Untagged photos don’t disappear from Facebook (you need to ask them to delete them for that to happen), but at least there will no longer be a call-out saying it's you passed-out in the corner with a lampshade on your head.